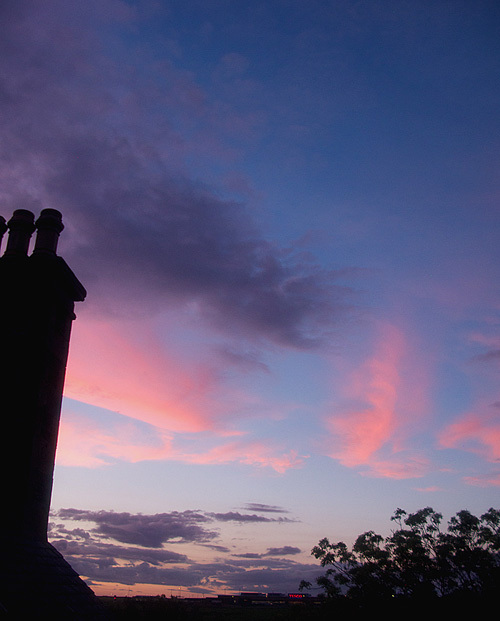 On Friday It was Midsummer Day, the longest day of the year; and here in Caithness, when we say longest, we really mean it: the sun rises just after 4.00 in the morning and sets just before 10.30 at—if you can call it that—night. The days are so long the birds have to take it in shifts to sing or they get tired out, packing up around dinnertime and going back to bed with sore throats. It’s been such a rubbish summer we celebrated the solstice by turning on the central heating for an hour, so the towels—and the house—could maybe get dry for a change. So, it’s back to a diet of hot, nourishing winter soups, and porridge for breakfast. In fact, I’ve been doing some research into porridge. I always thought that there were only two kinds: one which was made with water and seasoned with salt (the Scots or, as my father would say, “correct” way), and the other with milk and sugar (the incorrect way, also known as “spawn o’ the devil”)—and that, no matter which you adopted, you still ended up with something that looked like a pound of snails pureed in a blender. Turns out I was wrong (though not about the snails). 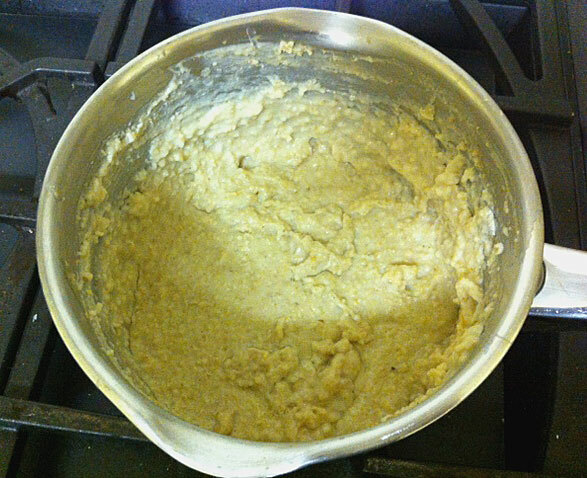 Since time immemorial porridge has been made with oatmeal, i.e., untreated ground oats boiled in liquid for half an hour or so to a consistency of wallpaper paste. But in 1877 the Quaker Oat Co. discovered a method of steaming the oat grains and rolling them flat (to make rolled oats), which means they absorb moisture more rapidly and only take 5 minutes to cook. As for me, I refuse to take sides: either is fine, so long as there’s plenty of sugar and cream at hand—and my father isn’t around to see. 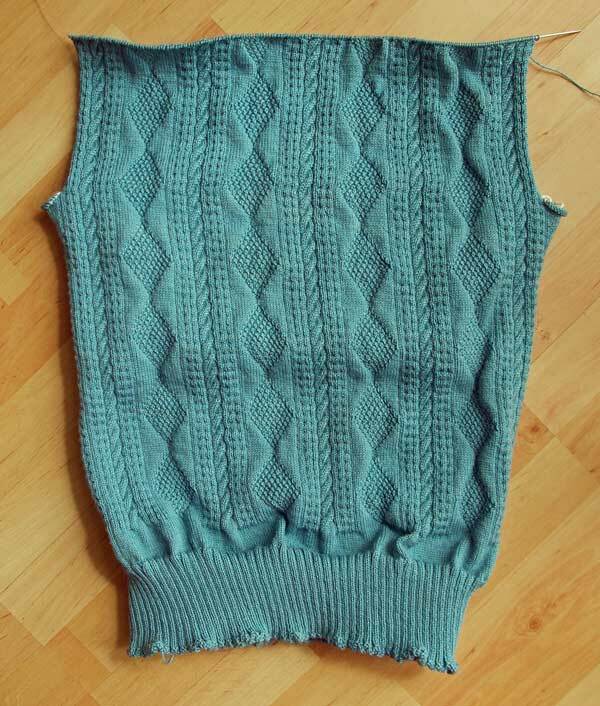 I’ve been making good progress on the gansey, and in a day or so I’ll be dividing for the neck and shoulders of the front. The neck will be indented by 1.5 inches, or half a diamond, so it shouldn’t interfere with the pattern too much. Then it’s onto the collar and picking up stitches around the first sleeve, something which is outlawed in several states as a cruel and unnatural punishment. Gordon, come to Finland for the summer. Just today : + 28 C, 97% humidity. The last time I faced that sort of humidity was in Philadelphia, and there were days when I refused to leave the hotel room, remaining hunched over the air conditioner in my underwear. And no one wants to see that again (least of all the chambermaid who didn’t notice the Do Not Disturb sign and had to be treated with sedatives…)! Not that the thought of visiting Finland doesn’t appeal. Snow – forests – Sibelius – I must admit, it sounds like my kind of place. Can you get ‘steel cut oats’ in your part of the world? It’s exactly how it sounds, the oat grain is cut and it pretty much looks like chicken feed. It does take 15-20 minutes of cooking but the taste is nice and nutty and it definitely isn’t the ‘slide-down-your-throat’ feeling as rolled oats can be. The gansey is SO nice! Call me crazy, but I really enjoy picking up the sleeve stitches, maybe just because it feels like I’m on the downhill slope of the project. None of the shops in Wick stock steel cut oats that I can see—the Scottish way seems to be to grind the oats into oatmeal (exactly the same as steel cut, i.e. unprocessed, just finer, resulting in a gloopier end-product). But judging by the supermarket shelves, most people up here just go for your basic rolled oats. I’m firmly in the rolled-oats group, but I do get the “old-fashioned” kind that take a little longer to cook. The advantage of rolled oats is that they don’t become a paste-like substance; the individual grains are still distinguishable. My favourite idea that I read online (why didn’t I think of this?) is to make a week’s worth of traditional porridge, cooking it for 30 minutes or more, then pour it into a lasagna pan to cool. When you’re done, cut it into brick-sized portions and store in the fridge. Each morning, take one out and microwave it in a bowl with a bit of milk or fruit or whatever, add a splash of cream, and voila! Breakfast in seconds. Judit’s comment reminded of a summer working in Trøndelag in Norway – it was cold, wet & snowed the weekend before Midsummer while the papers were reporting 27C in Finnmark in the Arctic. By the way, the Norwegians have a special porridge for Midsummer – it’s called rømmegrøt and is made of wheat flour cooked in oodles of cream & served with about half a pound of butter melting on top. This separates the foreigners from the Vikings; the former can’t move after two spoonfuls while the latter spend the rest of the not-night getting blind drunk on hjemmebrent (home-distilled liquor) & yet turn up for work without a hangover. I’ve just completed 4″ of my first gansey. Two questions: I’m not following any of the recorded traditional patterns – does this matter? & is there any way of taming double-pointed needles? Cathy, I never knit in the round with double pointed needles, I use two circular needles (same size), put half the stitches on one, half on the other, and the yarn follows from the end of one needle to the other. The “golden rule” here is: only use ONE needle at a time. You could probably see this demonstrated on You Tube. I use this method for going down the sleeves, and also for socks. I think the answer to your questions are, (1) no, it doesn’t matter, so long as it works for you. Lots of people don’t follow the traditional patterns and it seems to work out fine – I just do it because i lack imagination. (2) Practice, I guess. I tried but couldn’t get on with dpns for the body. It felt awkward to me, though I probably didn’t give it long enough, and the gansey flopped about, like trying to put a corpse into correct evening dress. So I chickened out and stuck with a circular needle for the body. But I still use dpns for the sleeves and collar, and that seems to work out OK, perhaps because the number of stitches on the needles are more manageable. 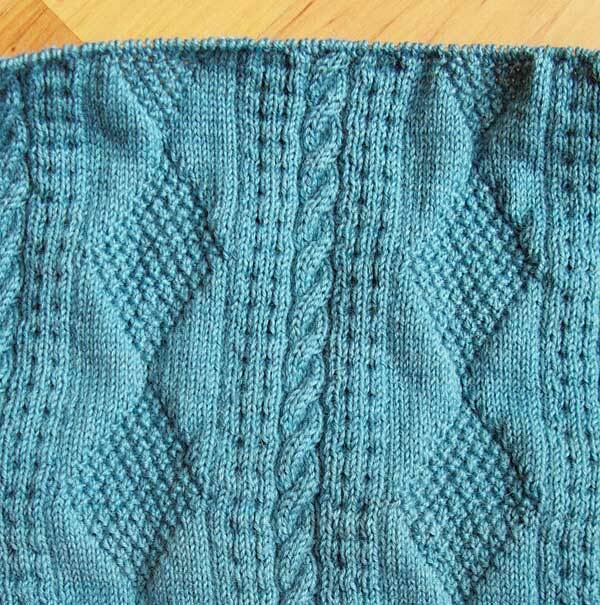 Do you use a knitting sheath to anchor the needles? Hello to Gordon and Margaret! Did you manage to peek out from under the duvet to see the magnificent moon this week? Wonderful. Minneapolis had hurricane force winds knocking down big trees this last weekend, so that was enough excitement for me. I’m in the ne’er do well camp of rolled oats and know now to clean the microwave immediately rather than be forced to chip off oatmeal cement (one trial learning). No, we didn’t get to see the Big Moon, the Caithness skies were awash with thick cloud, like the darkness that Sauron sent over Middle Earth before unleashing his armies to wipe out humanity. Fairly cloudy, anyway. Surely the technique is to unplug the microwave and soak it in a bathtub of cold water for several hours to make sure the porridge doesn’t stick? Of course, you’d have to buy a new microwave each time you wanted oatmeal, but think of the cleaning time you’d save! McCann’s steel-cut Irish oatmeal in the tin. Sorry – I know you’re in the land of oats Gordon. I live in New England and I’ve switched markets when they stopped selling it. It’s what we ate in Ireland – cooked with water, drizzled with cream and butter, no sugar. Get a super cheap, quart-size slow-cooker (also great for warming sauces, gravies and dips), set that baby up the night before. Bam you’re in business. And, because I live in N.E. and it magically exists – real maple syrup on top! Cue the choir. The gansey looks wonderful. I want it! I assume the choir you can hear is the heavenly choir after your arteries are exposed to all that cream, butter and maple syrup…? (Actually, forget the butter, that sounds bloody good to me!) I still sprinkle some sugar on top – it forms a nice crunchy crust – and drizzle some cream in a moat round the edge, but maple syrup is definitely on my radar. Bit expensive over here, alas. Yes Gordon, here in Finland we do add a bit salt to it. And even some butter, and/or different berries too. I’ve tried adding a pinch or so of salt, but I can’t say I can really taste the difference. On my travels last year I had some traditional Scots porridge made with water and salt, and it wasn’t bad – by which I mean I didn’t spit it out and spray the room like a fire hose, like the last time I tried it unawares. One hotel offered it with a drizzle of whisky, and given that the snow was swirling outside like a well-shaken snow globe, I could definitely see the point! Whisky – oh gaw, help us all – that’s a brisk start to the day. Gordon, I laugh out loud at your stuff. I neeeeed it. Even the deaf dog jumps off the couch. I’m with Judit – salt is a definite. It’s lovely on its own, but enhances any sweet addition. Really? Berries? And butter? Oh, wait, I hear that choir again. They’re just chimin’ in at the bliss (low cholesterol genes). Still, moderation here and there, but enjoyment everywhere. Judit, isn’t Finland the land of berries? And that was the only time I’ve seen butter on porridge – now it seems everyone has it. Or maybe it was the Vikings’ secret weapon: they bore down on Ireland, the Baltic and Vinland, fed the locals with a gruel so fat-laden they couldn’t move, then set about their looting and pillaging uninterrupted. Re your question about knitting sheaths, it was through reading your archives and links from this blog that I learnt about them. I’m using a old sock stuffed with more old socks stuck in my belt which is working quite well but interestingly is changing my technique. So practice it is. And a big thank you for the laughs and the inspiration. Re knitting sheaths, have you posted on Ravelry about this? That’s the go-to place for experienced knitters and they have a group for knitters of ganseys; and whereas I just have fun splashing around in the shallow end of the gansey pool, they put on the diving gear and really go deep. The people who post there are very nice and very supportive, especially of beginners, and I’m sure there would be people there who’d happily offer advice. There are several different berries in Finlands forests, as bilberry/whortleberry, raspberry, cloudberry,lingonberry/red whortleberry, wild strawberry, cranberry, arctic raspberry. Calgary’s gone from record floods (letting 6.5 feet of water over the top of the local dam at one point) with 100,000 people evacuated to +28 C today. Craziness x100. When the world gets insane, knit for charity! I’ve never tried knitting a life jacket cover, but there’s always a first time!